"Children's tales for disturbed children." 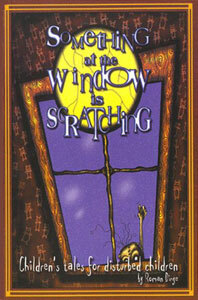 This is a dark, slick book of illustrated poems designed to spook the child in all of us. Roman Dirge is the writer/artist of the cult hit LENORE-- AMERICA'S FAVORITE DEAD GIRL from the publishers that brought you JOHNNY THE HOMICIDAL MANIAC. Did he come from Hell, or did he come to save us from it? When strangeness threatens to engulf the world, a strange man will come to save it. Hellboy is the world's greatest paranormal investigator. Unfortunately for him, one of the only mysteries he's never been able to solve is the mystery of his own origins. 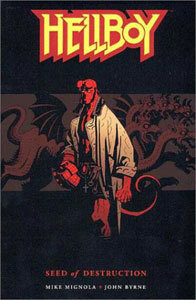 Red-skinned, pointy-tailed, and horned, Hellboy tends to stand out in a crowd. In SEEDS OF DESTRUCTION, Hellboy, the world's greatest paranormal investigator, is the only thing standing between sanity and insanity as he battles the mystical forces of the netherworld and a truly bizarre plague of frogs. And if he fails, we all fail with him! "...HELLBOY is a brilliant example of how to elevate the comic of the future to a higher literary level while achieving a higher pitch of excitement. Its story line combines traditional concepts with modern frames of reference, the whole being swept along by a virtuoso treatment of dazzling artistic effect...This is far from the "pop art" of the Andy Warhol world or the inane imagery of the drug culture. The creative approach found in HELLBOY is a newly evolving art form of its own, addressed and attuned to today." Eisner and Harvey Award-winning cartoonist Mike Mignola releases his fourth Hellboy collection, including the 1999 hit series Box Full of Evil, reprinted here with a new epilogue. Stories formerly available only in black-and-white-including Mignola`s contributions to the 1998 and 1999 Dark Horse Presents Annuals, The Right Hand of Doom and Pancakes are presented here in color for the first time. The VÂrcolac, Mignola`s contribution to Dark Horse Extra, is presented in a redrawn and expanded twelve-page version, and a new story, King Volmer, is printed here for the first time. On top of all this, Mignola shares his sketchbooks for the first time, showing readers the genesis of his personal take on the lords of Hell and other creatures. 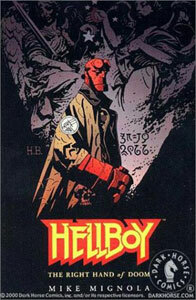 Hellboy is a paranormal investigator who also happens to be the son of the Devil. In this collection we follow Hellboy's journey, from his earlier days when he first taste of pancakes costs Hell the grip on his soul--to his later years where Hellboy learns that should he ever lose control he will bring about the Apocalypse. All the stories are good, most are modern retellings of old folklore stories. In the one about King Void, the Wild Huntsman who every night rides forth seeking the souls of damned. Less psychotic than John Constantine, more grounded than Fox Mulder, Hellboy is without a doubt one of the most original characters in comics today. 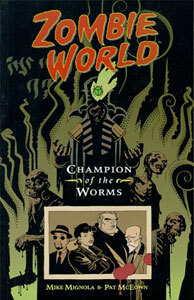 The artwork alone by Mike Mignola is worth it. A small-town museum is plagued by odd disturbances and missing persons-- gifts from the new kid in town, Azzul Gotha, the 42,000-year-old Hyperborean mummy that just checked in. It`s all-out zombie mayhem, complete with human sacrifice, a cemetery showdown, and the end of civilization.